The KER HELEN camping village is ideally located for your walks and bicycle rides. A few kilometres from the great dune of Pyla, 5 minutes from the oyster ports and the bird reserve, 15 minutes from the ocean beaches and 35 minutes from the Bordeaux town centre. 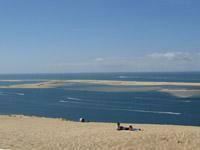 An ideal location for appreciating the beauty of the Arcachon Basin.